» Mobile eyephoneography (Madrid): agenda. 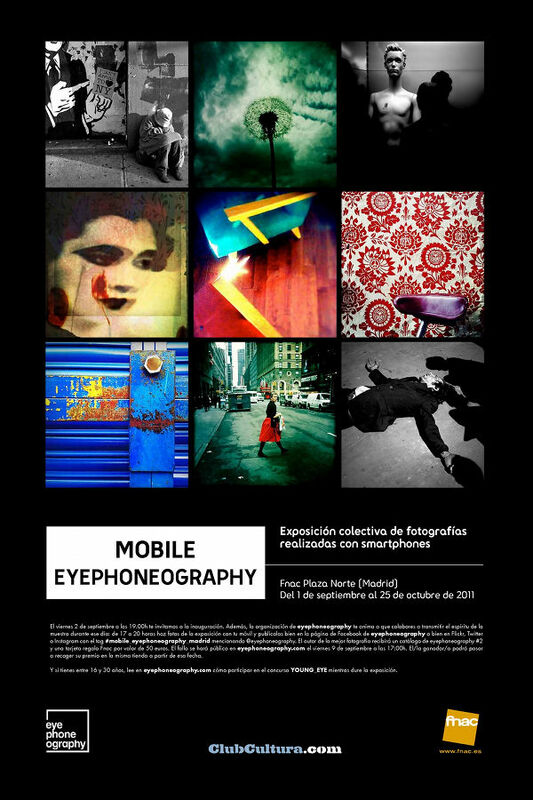 Mobile eyephoneography will hit the road Friday, September 2, at 19:00 at Fnac Plaza Norte(Madrid). The show will stay at this venue until October 25, 2011. This traveling exhibit is the result of the collaboration between eyephoneography and Fnac and features a selection of the work by the eight mobile photographers featured in the two editions of eyephoneography held so far: Carlein van der Beek (The Netherlands), Matt Burrows (USA), Sion Fullana (Spain), Stefano Giogli (Italy), Marco La Civita (Italy), MissPixels (Canada), Jordi V. Pou (Spain) and Greg Schmigel (USA). For more than a year, Mobile eyephoneography will tour eight Spanish cities aiming to establish a dialogue with local citizens about mobile photography with a vast array of activities (see the Madrid agenda below). How to participate: if you are present at the opening, document the event by taking as many pictures as you want and publish them either on our Facebook page or, using the tag #mobile_eyephoneography_madrid and mentioning @eyephoneography, on Instagram, Twitter, or Flickr. Prize: the best picture as determined by the jury will receive an eyephoneography #2 catalog (35 € value) and a 50 € Fnac gift card. Jury: eyephoneography and some of the photographers included in mobile eyephoneography. Participants: Rocío Nogales (eyephoneography), Sergio de Luz (professional photographer), and Sion Fullana, Greg Schmigel, and Jordi V. Pou via video conference (provisional). We will publish more details on how to participate in the discussion and interact with the speakers remotely. In addition, we will present YOUNG_EYE, a project aimed at all young people between 16 and 30 year old living in Spain. Mobile young photographers will be invited to submit a 3-picture series taken from their phones to answer the question: “What is it to be young in your city?” and have the possibility of participating in the YOUNG_EYE exhibit. Details will be as usually published here on this blog, so stay tuned. Would love to, but too far!!! Next time! Cuál es el plazo que tenemos para subir las fotos hechas de la inauguración del 2 de spetiembre? Gracias! Se aceptarán fotos hasta las 12 de la noche del día de la inauguración (2 de septiembre), aunque la inauguración concluye formalmente a las 21:00. Saludos!